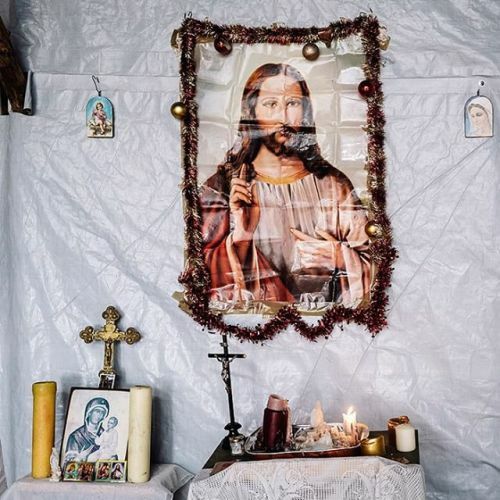 “Inside an Orthodox Christian #church at a #refugee camp outside of #Calais, France. There are also at least four mosques in the camp, which is made up of makeshift shelters housing about 3,000 inhabitants and known as the “jungle.” For many migrants traveling Africa, the Middle East and beyond, #Calais, 21 miles from the white cliffs of Dover, is the last stop. Every night, people try to vault fences or cut their way through them and climb onto trains or into trucks going across the Channel to England. If they make it across, many believe they will have reached safety and a better life. @tom__jamieson photographed the camp on #nytassignment.” By nytimes on Instagram.